Anytime I have the opportunity to pull out these old Prada platforms, I welcome it with open arms. I found them years ago at Last Call and they have been such a fun pair to show off when the mood strikes me. This denim dress has just enough of a 70’s vibe to pull it off, don’t you think? While I’ve dressed this denim number up with my favorite platforms, I’ve actually worn it three times as a swimsuit coverup with my go-to black bikini. It works for a number of occasions, surprisingly. Given the fact that denim will never go out of style, I thought I’d round up some other denim favorites (that aren’t jeans) – which are your favorites? This ruffled denim romper is too cute and would be perfect with wedges for a party this summer! This Proenza Schouler dress has been on my most wanted list, but the price point on this similar style is so much better, and it could go into fall. Here’s the perfect denim shirt to pair with white jeans or go full Canadian Tuxedo in. Denim skirts are coming back in a big way, but this skirt is really the only one I can see myself getting behind! This off-the-shoulder dress would fit right in at my house. Loving the wash on this classic denim jacket! this dress is so perfect for Summer, Asos has such great summer finds. Also loving the composition of these pics. Oh my gosh, Merritt! I love this dress on you so much. This is a different look for you, and I love how you’ve kept this fun ensemble so classic and refined still. You have created a spectacular fun vibe with this post. One that would totally inspire any super classic dresser to step out of her comfort zone a bit. Love this! Hope you are having a great week so far & thank you so much for your prayers for my pup. Such a cute dress and I love the idea of it being a coverup too! Anything denim is amazing. 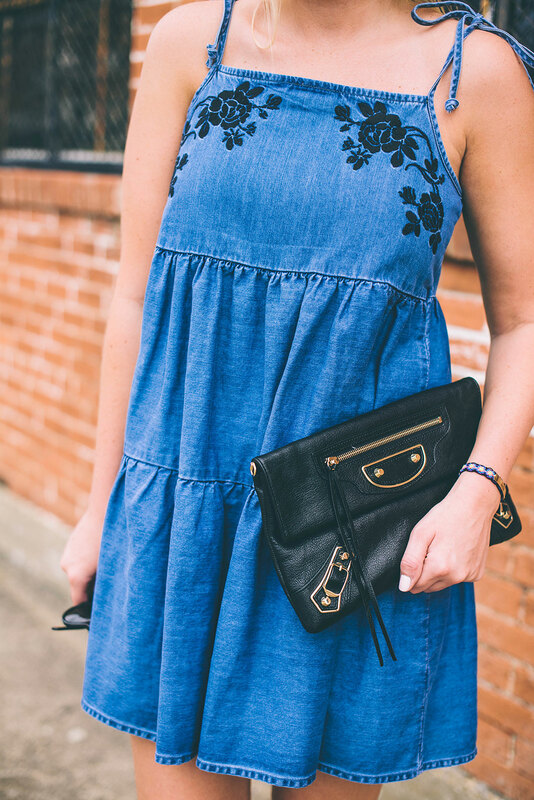 Love a good denim dress and the embroidered detail is so perfect! This is so cute on you, Merritt! How cute is that dress, I love it! Perfect with those platforms. Such a fun outfit! I love when a pair of shoes (or any accessory, really) works year after year, especially if they were on sale! Such a fun dress!! Love it! That dress looks so comfy! Perfect with sandals or wedges. It would even be cute as a cover-up!